When you don’t understand a culture and choose to dismiss it, rather than learn about it, you deny the existence of its people. That empty space is where casual stereotyping grows into a larger fear; what we don’t want to know about lives that parallel our own in many ways is taken over by what is magnified in the media as evil and projected onto the rest of a group of people who themselves reject it as what it for what really is—inhumane, part of no culture at all. Ignorance is easy; you simply turn your head aside and worry about what is in your path alone or take what you think is a majority opinion as truth. Some fall back on the ‘once upon a time, we were the only ones here’ excuse of denying other cultures, forgetting that human migration over the centuries means that very few—if none—of us could make the claim to some sort of geo-cultural purity. However, to take those claims as valid excuse are weak when also presented with the fact that humans are social animals—ones that have always lived in some form of community—and as such, function in similar ways. With the ever-increasing globalisation of culture due to travel and immigration—no matter what the reasons for the latter—to attempt to erase non-white culture or dismiss it as the negative to a white culture positive is to remove oneself from reality, and in doing so leads to a slow domino-effect decline of civilisation. It is perhaps an especial trait of Western society to treat non-Western (or indigenous Western, in the case of North America) ones with this view. It goes back to the days of Empire and beyond for British and Europeans, and to the treatment of Native Americans by settlers. And yet, for all horror of American gun culture being responsible for more day to day deaths than (international) terrorism—leaving out the problem of white domestic terrorism as well as unquestionable link between race and death at the hands of police, both of which come with its own cultural denial—ever was on their home soil, no one accuses Americans as a whole of being gun-carrying paranoiacs, with the sole aim of disrupting ‘a way of life’ and its ‘traditional values’. Logic of course tells us in this case that the minority does not represent the majority. And so the question loops back to why it is considered more and more acceptable to believe the illogical when the culture in question is non-Western. Now replace Pakistan with the name of your own country; cricket with whatever is the sport of choice; maybe reading is your preference rather than television; and regarding God: whether you believe in a presence or an absence, the individual aspects of what fulfils a person is exactly that—individual. Nothing in this list is unrelatable or specific to a single culture. But there is a prevalence of white perspective (exacerbated to the extreme by media and the gossip-like conflagration tendencies of social media), that chooses to redact the familiar and the human; what it leaves is a contextless fear—a myth. So how does one go about altering perspective, restoring the real story and face of a culture? To show the less attractive, downright ugly aspects of life here—while just seeming like an obvious inclusion to most of us in Western literature (perhaps even one we are numb to)—is a strong decision, especially in the context of the world as it is at the present moment. Her characters are drawn from all walks of life: the lifelong poor; the politically strong and wealthy; the average family. In the charming ‘Making the Team’, young Nida wishes for nothing more than to play cricket; her wish is finally granted, but not before discovering black-market dealings in stolen watches and suffering through a day of making innumerable beef patties; like any child’s reaction, the latter proves much more concerning. ‘A Mother’s Heart’ touches on widowhood: the newfound freedom that goes hand in hand with loneliness and the mothering of the mother by her son that results in moving away from everything she knows to join his family in America. Faruqi paints a beautifully elaborate, human picture of a culture: both mundane and conflicted, happy and despairing. If there is a complaint in regard to the stories here, it is a minor one—there is room for stories to go on further, and characters to be fleshed out even more—at times it feels as if the stories end abruptly. Even if, as in ‘Angel of Hope’, the poor seamstress Asma is given a fairy-tale ending in the form of a wealthy benefactress, we want to know how her life then continues: if her son recovers, if she finds a greater personal happiness than that of being rescued. But as noted, this is a small issue, and does not take away from the richness of the stories as they are. In offering us her Pakistan, she gives us the gift of learning about a culture at a time when the world needs it most, to counter and shed light on stereotypes at other times, show the simplicity and complexity of lives that could easily belong to any culture. These realisations are often the start of greater understandings, that kind that lead to the dismantling of the brick walls. Tomoé Hill lives and writes in Kent. Her pieces have been in The Stockholm Review of Literature, Open Pen, and LossLit. She is deputy & reviews editor at minor literature[s]. @CuriosoTheGreat. 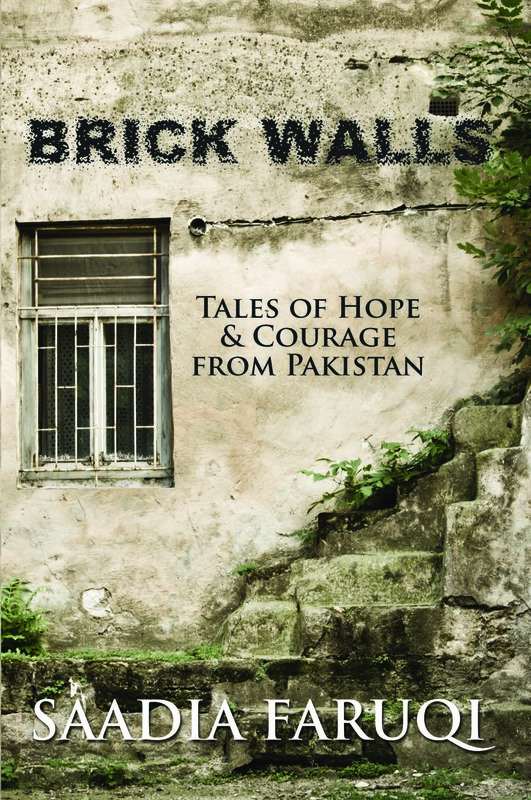 Posted in Book reviews and tagged brick walls, featured, pakistan, saadia faruqi. Bookmark the permalink.